Alright, I know you all must hate me right now, especially after leaving that cliffhanger post about tuning in later for the next post, and then leaving you, to wait outside in the cold pouring rain, sobbing, hoping for some sign of salvation, but to no avail. Fear not brethren, I have not abandoned thee! I just didn't feel like writing anything last week, so get off my back already! Anyways, I pretty much spent way too much time on the computer last week and not enough time getting out and socializing, going to the store, stretching the legs, showering, getting up to go to the bathroom, you know, things like that. So when I tried to write on my blog, I just didn't have anything to say. But don't worry, I finally got out yesterday, walked around, smelled the pretty flowers, and now the ol' personality is back. That's right, my cunning wit has returned like white on rice (okay, bad example). So I was reading the Oregonian once, and I read an article about something called The Famous Mysterious Actor Show. 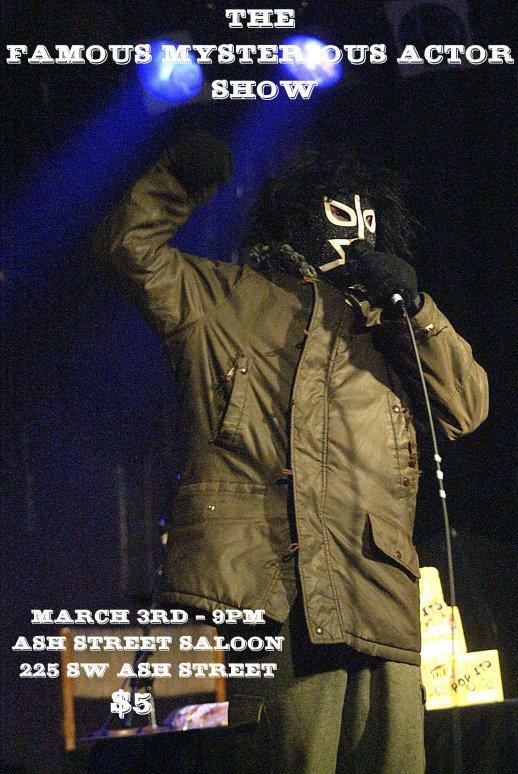 Apparently, there's some guy sporting a mask and a heavy coat doing a spoof late-night talk show in Portland, calling himself the Famous Mysterious Actor, or, Famous for short. So they've had this guy on KUFO a couple of times, and he is really weird. He says the most random, off the wall things (pshh, who does that?) and he talks in this weird little voice in the back of his throat. So I was listening to him on the radio, and I'm thinking, "Okay, this guy's just weird." So, he kept talking, and suddenly, I felt a laugh trying to escape. So I did my best to fight it, hold it in, while making little snort noises, until finally, I couldn't hold it any longer, and the floodgates of laughter burst forth. So listening to him, laughing, I didn't want to like him, but I couldn't help it. Anyways, it would be tough to put his humor into words, so the best I can say is that, while many comedians will take a comment or a thought and misdirect it, Famous will take it, chop it up into little pieces, smash them all together into a clay like substance, mold it into a shape that resembles a giraffe, then get onto the floor and start playing with it like a three year old child. If you've never heard him before, this probably makes no sense to you, but if you have heard him, you know exactly what I'm talking about. Anyhoo, you know what I haven't done for awhile? Pretended to have a time machine. So I think I'm gonna go head over to about 3500 B.C. and teach people about microwaves. Hello. Thank you for taking the time to scroll all the way down to the bottom of the page to read this. We don't get very many visitors down here, and are extremely pleased to make your aquaintance. Enjoy your stay and have a safe journey.